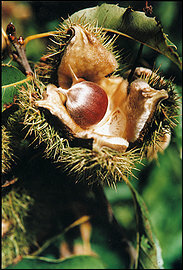 Today, the Ozark Chinkapin is still alive, but never able to reach an age to reproduce due to the virus that eliminated it from most of its range. 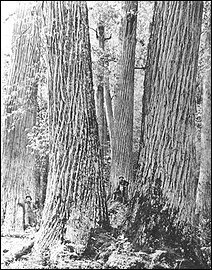 All woodworkers will rejoice to see (One hundred years from now) the restoration of this wonderful tree to our American forests. On another subject, Elliot Washor of the Big Picture Company sent me an article about our hands conference at the Maker Faire in Dearborn this summer. The illustration by Rachel Brian above is from that conference. 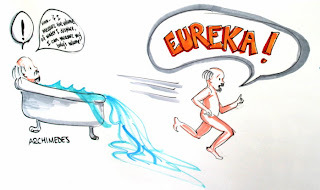 Being from Eureka Springs, and with the conference being about heuristic learning, I told the story of Archimedes running through the streets proclaiming "Eureka." All schools and all learning and growth should be at the heuristic level, that of discovery, and each school should consist of laboratories and workshops for self discovery, leading to such excitement that each student, like Archimedes would overcome his or her inhibitions in sharing it the world. What if children were to arrive home each afternoon, wanting to share what they had discovered in school? I am lucky to live in Eureka Springs and to have the Eureka moment evolve continuously in my work, and thanks to this blog, I can tell what I've learned without running naked in the streets. 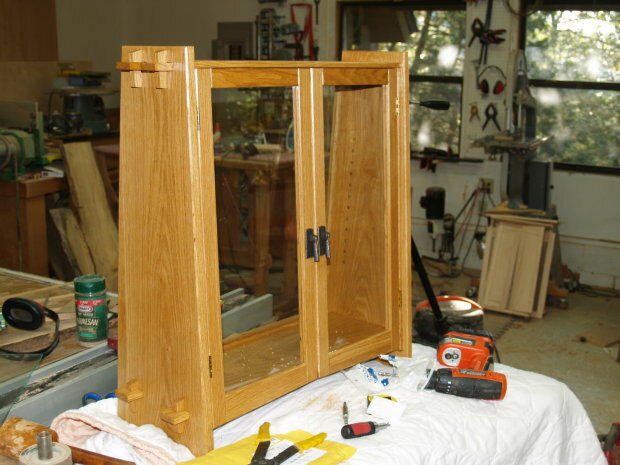 In the photo at left, you can see a bit more progress on my cherry wall hung display cabinet, the addition of a lighter colored interior. The wood is basswood, 1/8 inch thick. 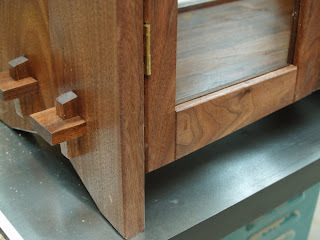 While the cherry will grow very dark in the coming years, the basswood will remain a lighter color, keeping the interior from becoming overly dark. what it takes to play ball. I was talking with a friend yesterday about the notion of keeping one's eye on the ball, and how things work connecting the body with intellectual pursuits and interests. It is fascinating, that with batting practice you simply keep your eye on the ball and let your body do its thing without restraint. Are intellectual pursuits like reengaging the hands in American education in the same ball park? You tell me. I suspect that many interesting things can also happen when you take your eyes off the ball and allow the universe greater participation in desired outcomes. The difference between pushing and pulling a rope is often a matter of timing. And so there is a window. You certainly don't swing (if you are practiced) before the pitcher does his wind up. You scratch your feet in the dust, align yourself in a good stance and maintain a good practiced grip on the bat. Only then, as the pitcher winds up, do you raise your eyes to the ball, and then follow it unceasing on its journey to the bat. You won't watch it go out of the park because you are too busy running toward base. The Complicated History of Baseball Stitching Machines It seems that there are still a few things best done by hand, and the video above is about how professional baseballs are still made. 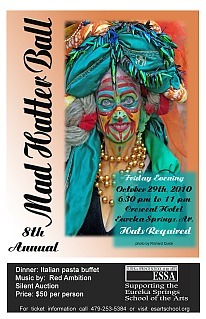 The Mad Hatter Ball last night was a tremendous success, raising money for the Eureka Springs School of the Arts. 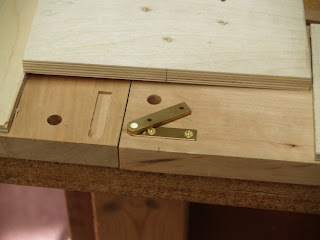 Today I am installing knife hinges, which can be a delicate operation requiring a plunge router and chisel. 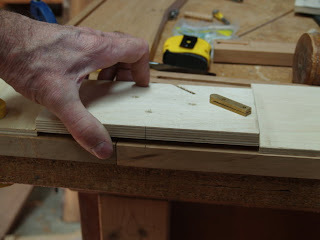 I use a guide block to establish the position for stop blocks to control the travel of the router, and rely on the router table fence to control the distance from the edge and then the router's depth control for how deep the hinge fits into the wood. We had a strategic planning meeting for Clear Spring School today, and one of the things we talked about was that each and every child become resilient and unfailing in the face of failure. One must be tested beyond one's limits to expand those limits. One of the things we learn from the child as craftsman model is that failure is an important aspect of development, learning and growth. In the photo at left, you can see continuing progress on my cherry wall hung disply cabinet, with the addition of the center stretcher between the top, bottom and doors. 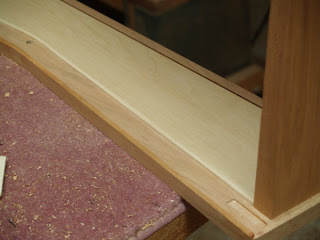 Like the cabinet sides this part is attached with dowels. It not only provides center support, it will be drilled with holes for shelf supports and provides a stopping point for the doors as they swing closed. 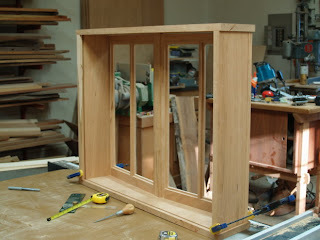 Next will come the fitting of knife hinges to secure the doors. 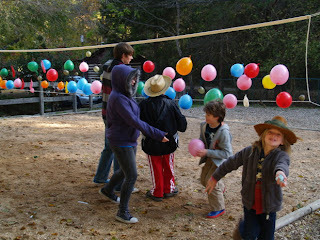 Today, we had the annual Harvest Party at Clear Spring School. I set up with work benches and tools to make small wooden pendants and shavings from pine. Each class does some form of game to share with the other students, and the whole project is designed to direct the Halloween energy into something more manageable and less focused on costumes having nothing to do with the children's in school learning. All students will come dressed as pioneers or early Americans and it takes little more than jeans, a flannel shirt and a bandana to fill the bill. This afternoon, and evening, I'll be busy with the Mad Hatters Ball, a fund raiser for the Eureka Springs School of the Arts, ESSA. I am one of those who would rather be in the wood shop than anyplace else, and I am grateful that if I ever have to attend an event where I dress up in a funny hat, I will at least have something to do there. As a founding board member, I'll be involved with set-up and clean up and will keep my camera busy in the meantime. All hats aside, I am a shy person in general and would not dress up in a funny hat except that I believe that every child and every adult should have the opportunity and responsibility to engage in and support the arts. On another matter, my daughter Lucy's organization at Columbia University has been named one of the most influential college charitable college organizations in the US for its work in Ghana. You can vote in the Classy Awards Here. Scroll down on the page and look for Engineers Without Borders in the category Most Influential College/Student Organization. Register and vote. 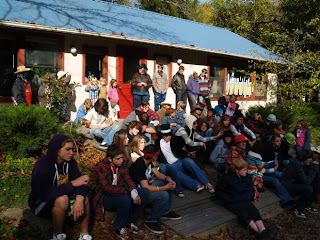 You can find a couple photos of the harvest party below. Each class provides activities for all the other students pre-k through 12th grades to enjoy. "I can't see why I would want to deprive my son of these basic childhood, human joys by enrolling him in classes meant to "encourage his cognitive development" -- shorthand for conforming to testable skills. Many of the most important skills are untestable -- imagination, general optimism and lightness of heart, the capability to love another creature, to empathize and demonstrate compassion. These are things a child can't bubble in on a Scantron sheet, and yet cultivating these attitudes matters more in determining how my son will exist in the world and what kind of contribution he'll make with his time on Earth." 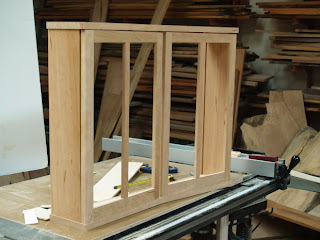 In the meantime, I'm working on center stiles for glass doors and am nearly ready to glue and assemble. You can see the joint in the photo below. It is cut using the table saw, and drill press, with a small amount of chisel work required to remove waste between the drilled holes forming the mortise. As you can see in the photo below, the doors are now glued and assembled with the edges trimmed. 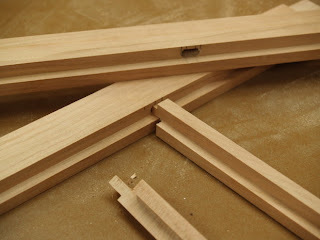 The carcass fits together with dowels. 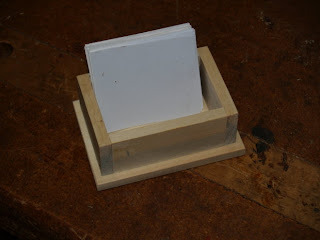 Today in the CSS wood shop, the first, second and third grade students made boxes to hold "math facts", which are small cards upon which are written the things that kids need to learn to use math. Teacher, Miss Jenny, asked if we could make boxes that would last the three years children are in her class and that would be used to hold their growing collections of math facts. My own prototype math facts box is shown in the photo at left. The kids were disappointed at the project. They wanted a free day or creative day to do what ever they wanted instead. Then when the boxes were finished they wanted to take them home, rather than be required to keep them in school. Joe said, "I want to give this to my mom!" Sorry Joe, one of the things you learn in school is that you may not get everything you want. In the meantime, we had a writer and photographer from the Democrat-Gazette visiting at Clear Spring School and in the wood shop today, which brought a whole new level of complication. Their finished boxes were brightly colored and more distinctive than my own, so they will be easily recognized in the classroom. The hands are the holographic expression of the full range of human physical, emotional, and intellectual reality. Or you could state that the full physical, emotional and intellectual reality of man is the holographic expression of the hands. If you have hands, through which to express, it is a toss up. I tinker, therefore I am. In my home wood shop this morning, I cut and fit bridle joints for cherry doors. The sequence and accuracy was improved by my new stop block. In the photo above, you can see the other use for it... that of preventing "trapping" of cut off parts. The stop block slides to the operator's left to set up the cut, and then moves to the right so the cut off piece not interfere with the cut. 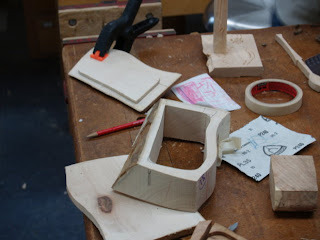 The photo below shows progress for my 7th, 8th and 9th grade students in making band sawn boxes. One of the things they just don't quite understand yet, is how closely you have to observe and check on your own work. Put on one clamp, check the alignment of parts, add another clamp and check the alignment of parts again. Then check again. No, don't walk away from it yet... 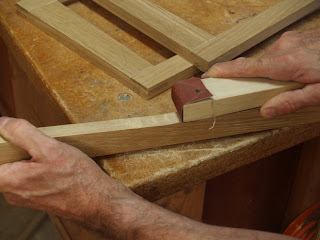 They seem to believe that a lot of glue and one clamp will do the job, when what is really required is a little glue and a lot of clamps to hold things together as the glue sets. But experience is the best teacher. When they come back and ask what happened I'll try to explain things to them. 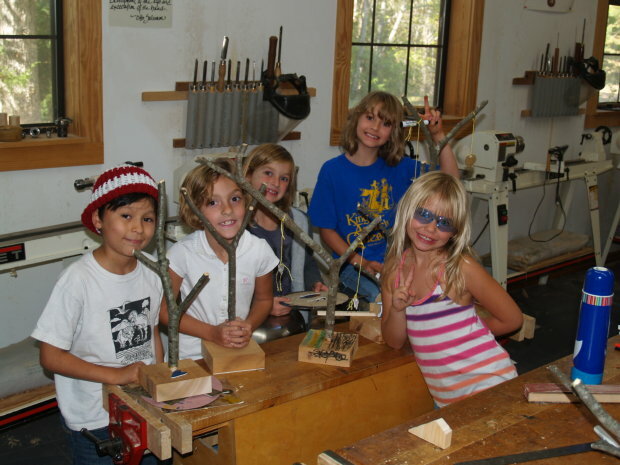 In the wood shop, making real things there are no guaranteed successes and many opportunities to learn from mistakes. 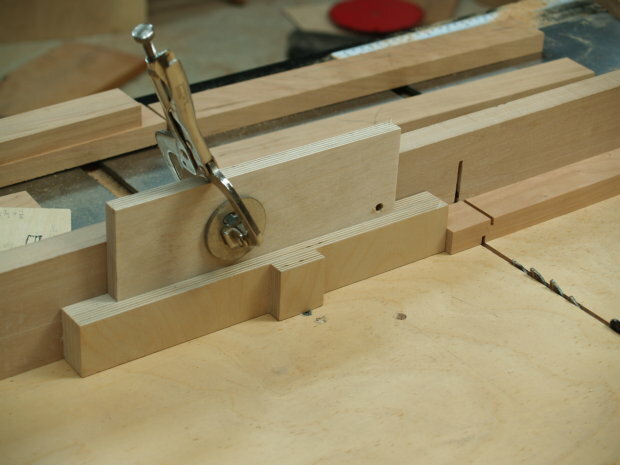 This is my newest invention, a stop block that is reversible to offer two positions for offset cuts. It is particularly useful for cutting the tenoned rails for bridle joints for glass doors in which the top and bottom sides are offset to allow for the glass to fit. Can you see how simple the idea is? The surprising thing is that it can take years of doing such things to be in the exact right place and time to discover something so simple and new. This device is useful because the measurement for the 1/4 inch offset between cuts on the top and bottom is built in. The first cuts on the face sides of the door rails are made with the face sides down, with the shorter arm of the device defining the space between the clamping block and the blade. Then the block is turned end for end without changing the position of the clamp, with the 1/4 in. longer block moving the work piece 1/4 in further from the clamping block. This creates an exactly 1/4 inch offset front to back. The idea is that it should be easy, fool proof and exact. In the Clear Spring School wood shop today, I watched my 4th 5th and 6th grade students "thinkering and tinkering"as they worked to design toy cars. 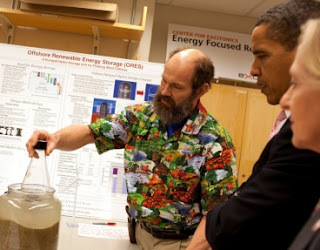 Ozric told me, "I don't know what I'm doing, but I think it is going to turn out OK."
Tonight, if it works out, or some other Monday Pasta night, I will be visiting with Professor Alex Slocum of MIT. I had not quite met him at the Furniture Society Conference this summer, but wanted to, after hearing him talk very briefly about the hands. You can learn a bit about him from this site. The photo shows him explaining a method for storing energy on the seafloor to President Obama. 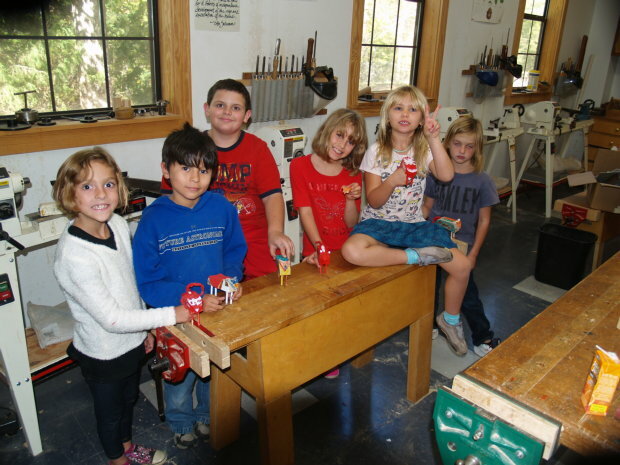 Today in the Clear Spring School wood shop, 4th, 5th and 6th grade students will begin working on our annual toy making project, and the 10th, 11th and 12th grade students will continue work on their fabric boxes. 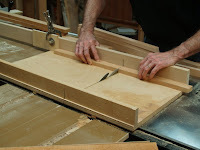 I am starting work on a new blog for the new Fine Woodworking website, Start Woodworking.com which will migrate to its new formal address with a launch date of November 16. Happy late birthday to me. The idea is that I will write a couple posts each month along with other contributors, all with the purpose of creating new enthusiasm for younger readers. It is somewhat difficult to consolidate my opening thoughts. In the meantime, I am making progress in my use of google sketch-up software in illustrating work. If I can get good at it, it should allow me to more quickly illustrate project designs. An article from the Washington Post describes an alarming decline in the number of young men finishing college. That should not surprise anyone who has been paying attention. As we have made schooling less hands-on, there is far less in school to engage the interests and attentions of young men. That can be noted across the board, from elementary school, through university education. If the hands are not engaged in learning, neither will the heart be. Today in the wood shop, I've been making parts for doors. I use a sled and stop block to make certain that each part is cut to the exact length required. With all the pressures and waiting for superman, here is another look at education. Watch the trailer... Race to Nowhere. 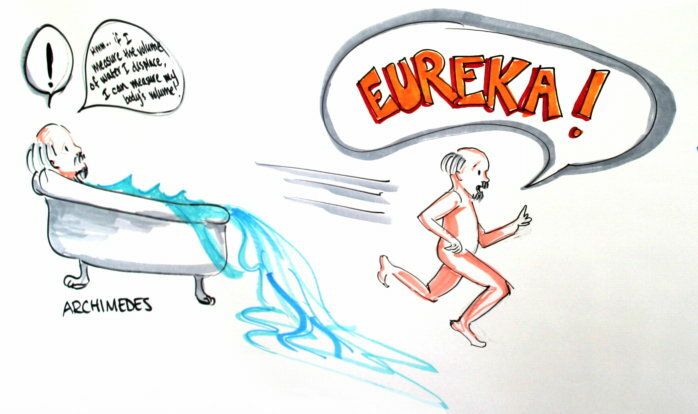 The idea of course, is the question, why do we take all the fun out of learning? When learning is the most exciting thing about being a human being, we have created schools that are almost no fun at all. 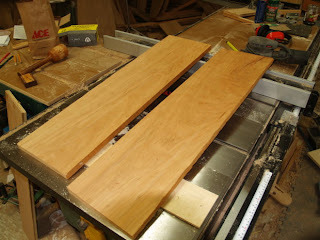 Today in the woodshop, I continue work on my cherry wall cabinet, and will begin making the doors. "We should be waking children up to what they have inside themselves." The Arts. Kids these days are busy twiddling and twirling fingers on touch pads, getting good at what has been designed to grow easier with each succeeding generation of hand held devices. Kids these days, holding those devices, have the whole world at hand, excepting of course, the ability to make something lasting and tangible of it or within it. I have been invited to begin regular blog posts on a new Fine Woodworking website dedicated to beginners, and it is really about time that we have all begun to take a greater interest in bringing new and fresh hands into the field. I am grateful for the opportunity and my first posts may come in a matter of a few days or weeks, and I will tell you all when it happens. Most of the readers for woodworking magazines are in the ages of 50 and up, corresponding with the last generation to have had school based wood shop opportunities. It has become pretty common these days to see children instructing their parents in the use of hand held devices. I heard yesterday of a toddler, 3 years old instructing her mother in the use her iPhone. The same report told that iPhones are being used as baby sitters for children in the same manner that TVs once were. Plop your child down on the bed with an iPhone and you can go do all kinds of stuff, cook, clean, sh_t, shower and shave while your child is entertained and distracted by the device. It used to be that knowledge was transmitted to the young through the loving attentions of the old and elderly as they passed on their skills and techniques. What you would see in homes throughout every land would be the imparting of instructions in the full range of human creative tasks. What we see in the hands on twiddling and twirling of touch pads by kids is a darker revolution, displacing the heart from the relationship between the very young and very old. I'm not sure what we can do about that, as a broad phenomenon. But on the home front we can still take children by the hand and introduce them to the things we love. When we take the time to cook, fix, make, create, as a shared thing, with children at hand, we are doing what parents and grandparents have always done, and there is power in it that lasts generations. Today I am balancing my time between the wood shop and the computer, trying to learn to use google sketch-up software. I am late on the curve as many woodworkers have been using this software for some time. My objective is to make parts each day for a small, wall hung display cabinet, and each day make the parts also using the 3-d modeling capacity of sketch-up. Many woodworkers design first and then make. I make first and then design... a bit backwards, but an approach that allows me to make the best use of the materials at hand. Is there a knot in an inconvenient place? I can adjust the design to make use of what I have. One of the attributes of sketch-up is that I can play with the work as it develops, and check and record the measurements of what I have done, and provide better information for anyone hoping to follow my efforts to create the same piece. Also, today, I have a call scheduled with an editor at Fine Woodworking, seeking my participation in their new beginning woodworking website. 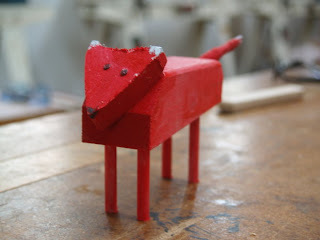 Today, with the 1st, 2nd, and 3rd grade students at CSS we made foxes in the wood shop. They are studying mammals from the local forest, and the fox is one of my favorites. 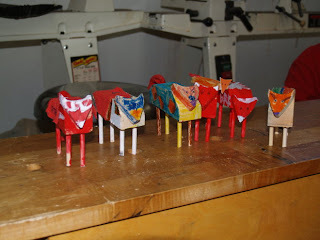 The kids loved the project, but decided to give their foxes some special decoration in vibrant colors. Here in the Ozark forest, we have silver foxes, and gray foxes in addition to the more often illustrated red variation. Today, I learned that in children's imaginations, they also come in blue and green and wear clothing. It was a fun time in the wood shop. 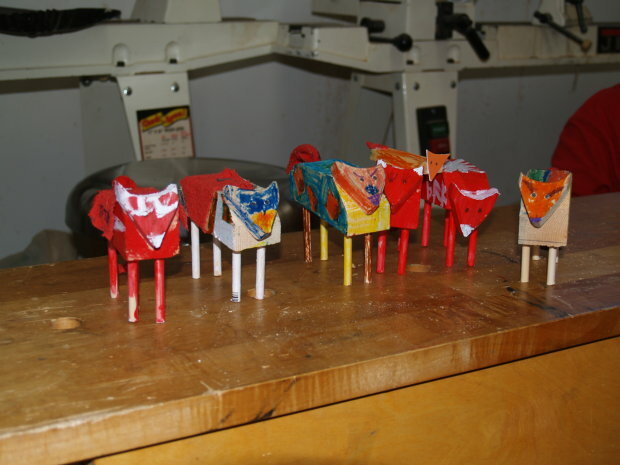 To make these, the kids cut out the bodies, drill holes for the legs which I provided already cut in the right length. I cut out the faces using a scroll saw, and pre-drilled the nail holes, as I have learned that they split very easily if I do not. Diane Ravitch has offered an essay on the Myth of Charter Schools that some of my readers will find interesting. It is in response to the movie, Waiting for Superman that actively promotes charter schools without noting that 83 percent perform no better or worse than public schools as measured by standardized tests. The Athena Theory is at best, a flimsy first-line defense against faulty accounts of artistic endeavor and at worst a last resort of aesthetic Platonists who would make of the artist a blind seer of his own works. Unlike the Athena Theory, the Penelope Theory is less an inheritance from philosophy than a distillate from the artist's work experiences. It depicts the artist in his studio as a kind of devoted weaver of works, doggedly repeating the same sequence of motor acts, parts or wholes of works or performances until he "gets it right." Can you see that dogged determination is what we too often miss in American schooling? And hence why the the development of skill through the arts is essential? It is interesting being in a wood shop with kids. Even in the isolation of my own shop, as I hone skills and practice the work of making things from wood, there are aspects of performance to it as I observe myself in action and as I bear witness to my own growth. 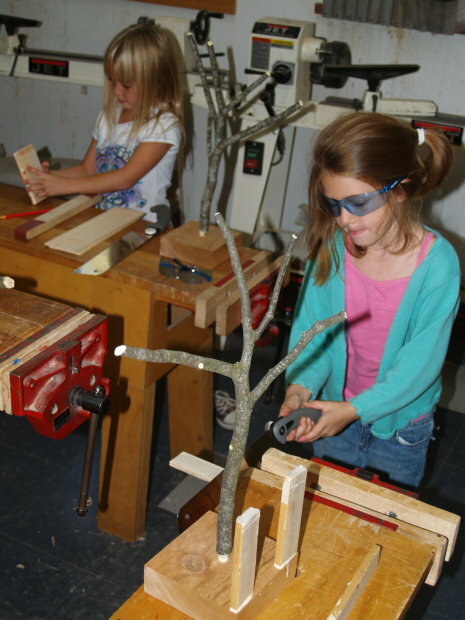 In the school wood shop, the dramatic effect of performance is even more prevalent as students demonstrate their development of skill and artistic vision to themselves, to their teacher and to each other. 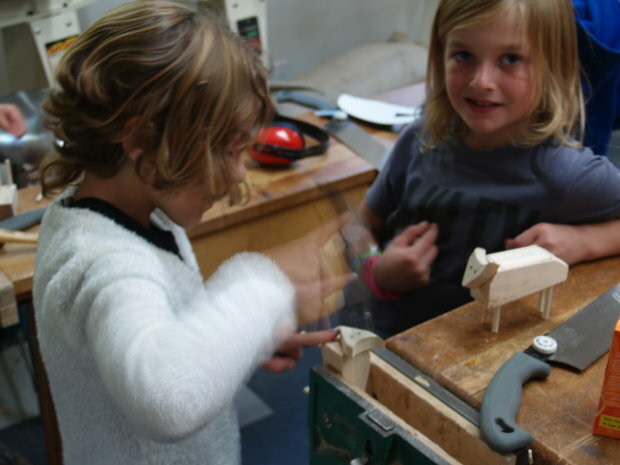 The "child as craftsman" metaphor sees the child as being someone motivated by the need to demonstrate skill and be acknowledged for its expression. With the recognition of the importance of skill, each classroom in America might become a place in which all children find artistic expression and engagement. Perhaps the superman we wait for, is waiting within each child, and not perhaps what we would expect to find on the silver screen. Today in the css wood shop, 7th, 8th and 9th grade students began making band sawn boxes using the wood blanks shown above. Each student drew a slip of paper numbered to match a specific blank from the pile of woods. Some are sycamore, some red oak, cedar, or mimosa. 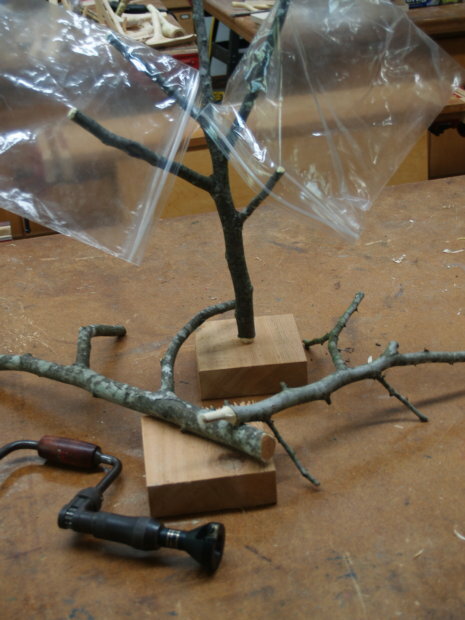 Starting with unusual woods will guarantee many possible creative outcomes in making boxes. The following is a bit more from Vernon A. Howard in his essay, "Artistic Practice and Skills." "Among the cognitive aims of practice is knowledge not only that one has succeeded or failed to perform up to a given standard, but why. Even where achievement artifacts like a score, sketch or print (or a box for that matter) can be examined at leisure for the levels of skill they reveal, further scrutiny of certain intrinsic features of the skill activities themselves, such as fluency in the use of a notation or improper handling of a brush or chisel, may yield important insights into the causes of one's success or failure." The important thing here, is that Howard is talking about reaching standards, but known, observable ones, inherent in the task at hand, that can be grasped and seen as relevant to growth of skill, technique, artistry, and more. How different that is from the standardized testing that has become the dominant feature of American education. Imagine standards that also provide evidence of exactly where and what can be improved. The arts have it, hands down. Make, fix, create. Today in the Clear Spring School wood shop, the 4th, 5th and 6th grade students finished their walnut cutting boards and the 10th, 11th and 12th grade students worked on their folding fabric boxes. Part of the process of working with wood is to begin looking more closely at things. Tiny scratches in the wood are not apparent until the eye has been trained to look closely at the object and the heart has been trained to actually care about results. These things aren't automatic. In order to care, you must first understand that things are within your power to effect. I am attempting to learn Google Sketch-up to help develop plans for my Small Cabinets book. Have any of my readers mastered this interesting program yet? I have hopes that it will help me in developing drawings of project plans for distribution on the net. If you have tips on the use of this program please share them with me. Watch and listen for this line... "It is important in science to have skillful hands." This short video is another exploring the effectiveness of education in Finland. You will note that it is hands-on and it is about discovery. Anything less is dogmatic and fails to gain the dedicated attention of learners. What in the world about this is so hard for American educators, administrators and politicos to understand? 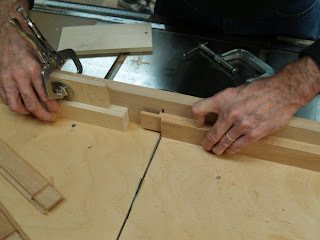 "I teach woodshop at a public high school in St. Paul, MN and wanted to write you and tell you that your box making book is taking my school by storm. I recently was told to teach a reading based woodshop class where the students had to read as much as cut wood. The students found it boring to begin with but when I introduced your DVD and the first section of your book to them, including the introduction, my attendance went up and stayed up and the students loved the simple design of your lift lid box. I am just finishing up my first set of boxes today and I have students, whom I don't know, coming by and they ask to build one! Thanks so much! It's easy to teach to students with enthusiasm! Your book made it possible." 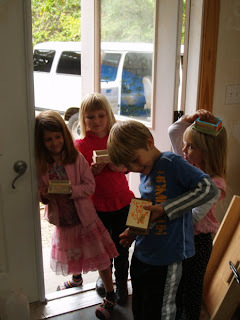 Box making is such a wonderful way to become engaged in woodworking. The amount of materials required is small. The amount of storage space for materials and materials handling is small and far more predictable. You can learn every form of woodworking skill by making boxes, using every tool in the wood shop and learning what it and you can do. You can make expressive heirloom objects that motivate students to learn. I hope to develop a school woodworking curriculum based on box making in response ot the obvious enthusiasm that students express. 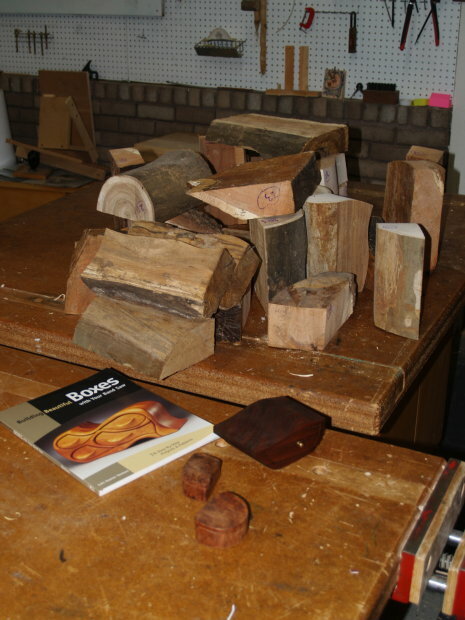 Next week, my middle school students will begin making band sawn boxes, so today I will spend some time preparing materials for class on Tuesday, and I plan to have a discussion with Fine Woodworking about it later in the week. Just in case you've been wondering what in the world is wrong with American education, here is a handy tool to help figure things out. Just cut out the arrow, attach it with a pin at the center of the dial and spin. It helps if you cut the arrow and spinner base from card stock, so it will last for a few years and you can keep playing the same blame game until the cows come home or we completely destruct. I was reading this morning about "Waiting for Superman" and learned that it comes down pretty hard on teachers unions. You can tell where their spinner went. But you can spin your own and draw your own conclusions. 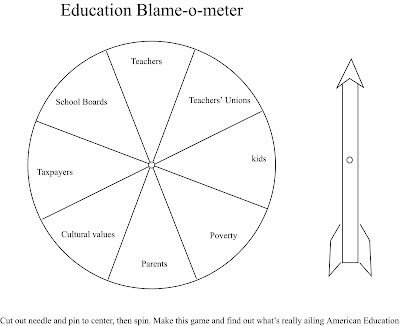 In the meantime, you might learn through the actual making of your own game what we really need in American education. 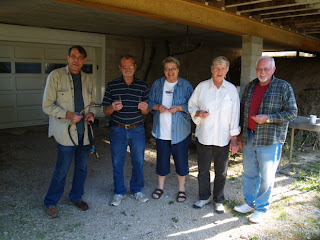 Scissors, real tools and the chance to engage the hands in making real things. I call it the strategic implementation of the hands. Make, fix, create. Click on the image above to enlarge it to a useful size. Feel free to reproduce this game to share with your friends. 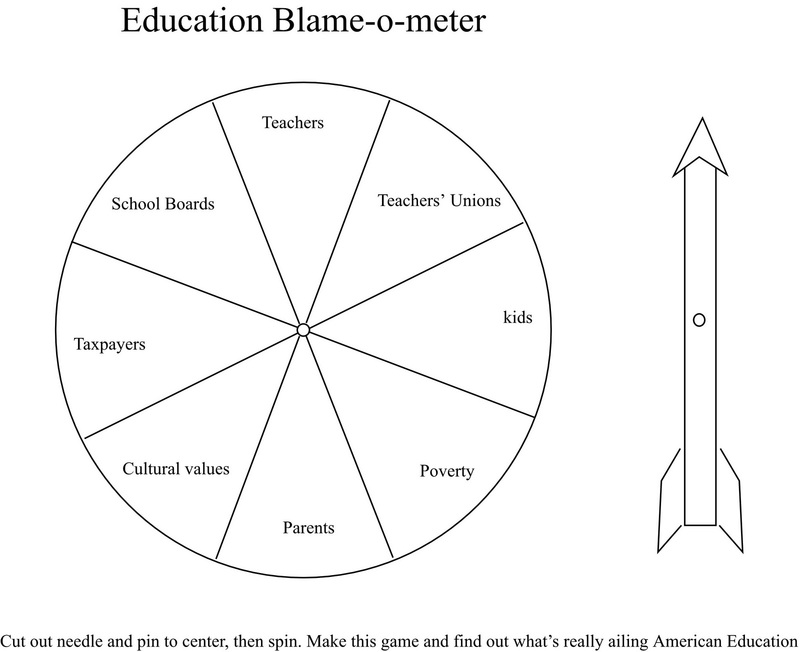 You will discover that they are already playing and are good at pointing the finger in at least one or two directions, and the blame-o-meter may be useful in pointing out that there are reasons for failing schools they may not have thought of yet. Please inform them of the wisdom of their hands. I have been working on my mission style display cabinet and it is nearly complete now that I've added the glass to the doors and Stickley style hammered copper hardware. I am working on the text and drawings to add this project as a chapter of my Making Small Cabinets book for Taunton Press. The more contemporary walnut version is shown below. craft apprenticeship, in depth learning. 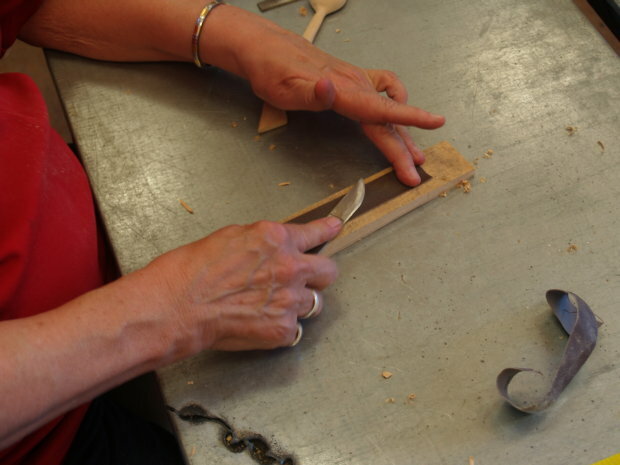 John Grossbohlin sent the following article about apprenticeships at Colonial Williamsburg. Craft Apprenticeship in Historic Site Museums. The article brought to mind a conversation from earlier in the week with my 7th, 8th and 9th grade students. They were finishing one project and I invited them to work on their practice blocks for chip carving. The following is an example of the conversation that followed. "Oh, yeah. I did real good." "Show me what you did and show me your technique." "Oh, I think I'll start over. I need more practice. Will you show me how that one knife cut again?" There is truth in doing real things, and the opportunity to learn in greater and even greater depth. "Been there, done that" is what you hear when you have only touched the surface of the subject, and is an obstacle to the development of skill. 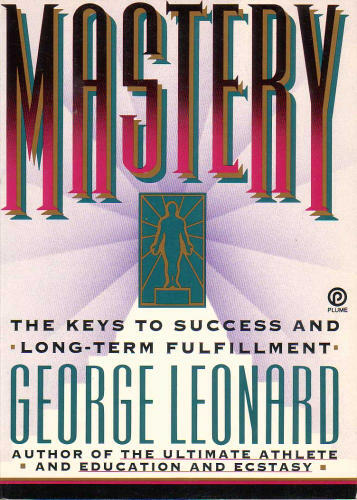 Toysmith added suggested reading in a comment below on this subject, Mastery, the Keys to Success and Long-Term Fulfillment, by George Leonard. An interesting philosopher, Krishnamurti, had suggested that truth as an absolute was difficult to arrive at, that it was "a pathless land." His point was not that there was no truth, but that the discovery of it would not be paved in stone, a path laid down by others. It must be reasoned and discovered for oneself. In each of Krishnmurti's hundreds of public lectures, he encouraged his listeners to discover for themselves. We have a culture in which politicians are at odds over what to teach children in school. I watched the debate last night between two Senate candidates. One believing that Darwin's theory of evolution was a lie, insisted that schools be allowed to teach what ever "truth" they want. The other candidate expressed concerned that we have lost our competitiveness in science, math, and technology education are becoming a 2nd tier educational nation. I'm inclined to better accept the latter than the former. Despite freedom of belief and religion, truth is not just something you can make up. You're welcome to believe whatever you want, but belief is not the same thing as reality. Still, candidates from different political parties and religious faiths have differing opinions over what facts and theories constitute "the truth", and would rather sacrifice our children's investigatory inclinations than have their own beliefs challenged and discovered to be absurd. I have learned to try and stay away from politics in the blog, but education in America has become criminally political on both sides, with each side trying to use our children's lives to further their own political agendas. Are our schools to be the places where we cram facts, approved theorems and opinions into our children's heads, or are they to be places in which children learn and discover for themselves. If we wish to raise mature citizens to make reasoned assessments of facts, discern truth from fabrication and make wise decisions for their own cultural and physical survival, we must restore schools as places where children discover and learn rather than being taught. There is a simple path for that. Craftsmanship is discovery. As children process and use materials in the making of beautiful and useful things, they discover and learn and grow and the vector of their comprehension is toward truth. Craftsmanship is the foundation of science, math and technology and it is also the clearest means through which to develop a sense of self. Think of our children as craftsmen/scientists and our schools as laboratory workshops and we will begin to be on the right path. Anything less is a distortion of our children's innate intelligences and capacities. Put a tool in a child's hand. You really don't know where that child will go with it, or what he or she will make. The path is uncharted. We do know where the journey begins and that truth is not something that can be taught, but a child can be encouraged to discover. Despite what we think to be out best intentions, anything less is indoctrination and dogma. I had been asked by a Clear Spring School mother about making plastic bag drying racks for those who wash and reuse plastic bags. It is certainly an admirable notion that some could be so thrifty and thorough in meeting environmental responsibilities. Today the first, second and third grade students used the materials we had gathered in last week's nature hike to make the trees. All the students wanted their drying trees to be decorated in addition to their natural beauty, which would have sufficed for me. How can one stand in the way of creativity and enthusiasm? This was also the pick up day for the 36th annual Trash-a-thon at Clear Spring School, a day in which students and volunteers fan out across the city to gather trash from along the roadsides. Trash-a-thon is an award winning fund raising event invented 36 years ago at Clear Spring School. The students solicit pledges from the community to support the community improvement effort. 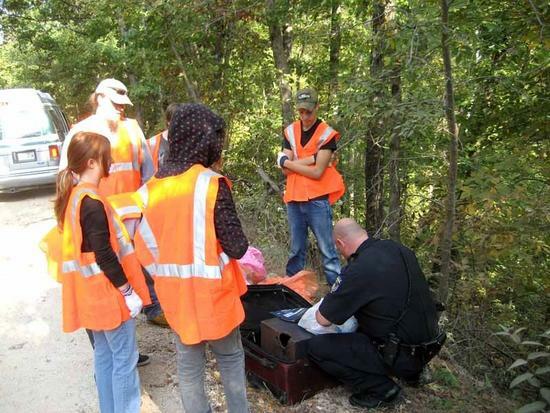 Usually the students find a few interesting things as they explore our hillsides in search of trash, but this may be the first year that what they've found may help solve a crime. Students found an abandoned suitcase containing evidence from a robbery from the Good Shepherd Thrift Store in Eureka Springs in May 2010. You can read about it in the Lovely County Citizen. The photo below shows Clear Springs School students with Eureka Springs Police Detective Thomas Achord. One of the things that those who watched the BBC video on Finland's schools would have noticed is what they call the comprehensive school concept. The students are not segregated with regard to learning potential, but are all in the same classes from first through 9th grades. We make the mistake of dividing kids for "gifted and talented" programs to alleviate boredom, and to give special attention to those with learning disabilities. But the segregational aspects of that concept have long term consequences. Some kids are branded as dummies, even though they may have great intelligence and potential outside of reading and math. Some kids are placed on pedestals and may arrive at false notions of superiority. Some children's maturation may be delayed or simply advanced. When children in classrooms have the opportunity to express a wide variety of intelligences, children learn that each may be very good at something and that all children have something of value to contribute to the overall classroom learning experience. When children are all together in a classroom, they learn that they can help one another. Can you see that we have become diminished as a society by a few simple things that we seem to have not known or forgotten? "It's also important to know that you can have a really active, athletic child, but it's still not OK for them to spend three hours a day on the computer." The study confirms the direct relationship between between the amount of time spent on computers and watching TV and anti-social behavior, attitudes, and psychological problems. While we're waiting for "Waiting for Superman" to come to a theater nearby, the need for educational reform in the US is not a new thing. The TV segment above is from 2007. Some are still wondering how to get a handle on schooling. Either education is shaped by the hands, engaging the hands, utilizing the power of the hands to engage learners, or it is abstract, isolating, and fails to engage learners and shape young lives. I call my own fix the "strategic implementation of the hands." It is a simple thing. Fix, make, plant, sew, sow, make music, make art, make messes, test principles in your own hands, learn, grow, and then proceed to learn for a lifetime. Today at Clear Spring School, the 4th, 5th and 6th grade students worked on walnut cutting boards. There are a couple reasons for this project. First, the wood invites scrutiny, just as our students are beginning to plan their science fair projects. Craftsmanship is the foundation of science as students begin exploration of material qualities and physical reality. I am interested in getting the students to look more closely at wood, and to realize that by examining it, you can learn its story, where it grew within the tree and for how long. 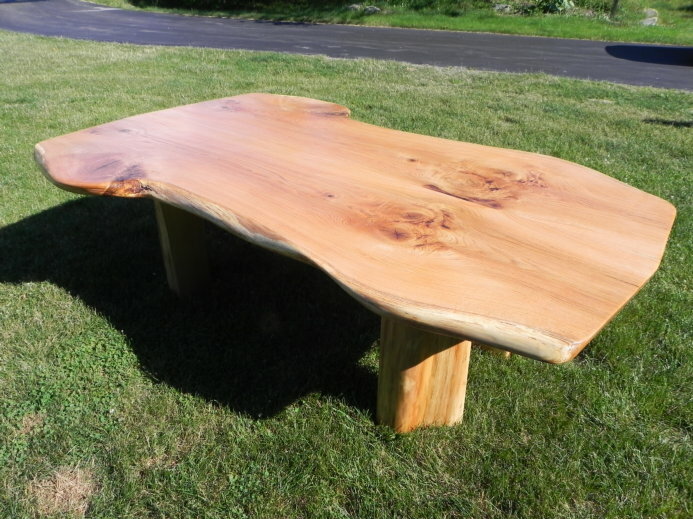 I also want to use the products from wood shop to reinforce the relationship between school and home. 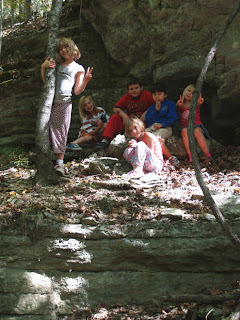 Often children don't know how to respond to the question, "What did you do in school today?" Having concrete evidence of the school experience, invites conversation and reinforcement of important values. By making things that are useful in the home, the student is no longer just a dependent child, but a contributor to the well-being of family and home. 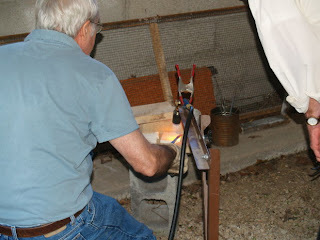 Today at ESSA Larry Williams helped us in heat treating the blades for the carving knives we're making. Despite what we have all been told about watching for the color change in the steel, Larry instructed us to look for other, more sophisticated signs that the steel had reached the optimum temperature. You begin to see circular shapes, like two dimensional bubbles of iron forming on the surface of the blade which are still visible after the steel is quenched and as shown below. Watching the bubbles of iron form on the surface of the blade is like watching sunspots form on the surface of the sun, but fortunately not as bright. When the spots form, quench. Continuing to heat will cause pitting of the blade. 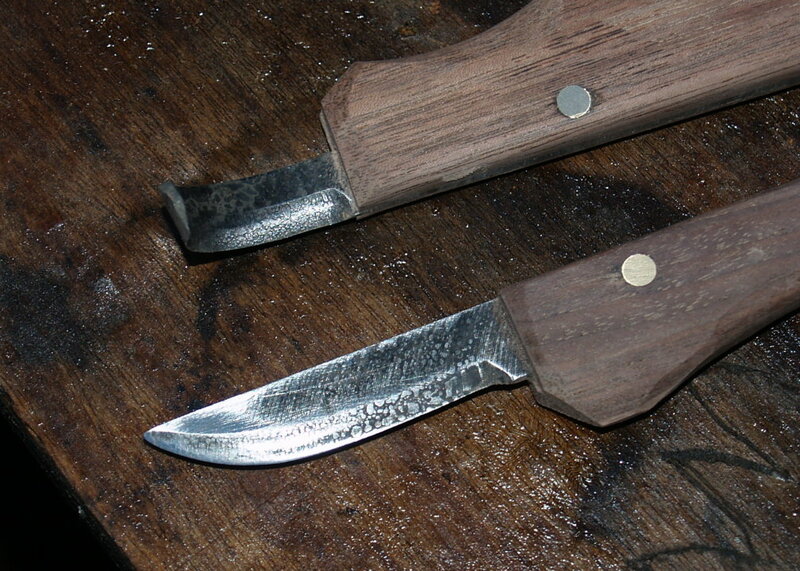 Tomorrow the knives will be completed with handles and put to use. The title is a bit fuzzy about the term or exactly how it applies, but this essay from Rick Ayers, It's time to Decriminalize Learning, suggests that American education is tied ball and chain to standardized testing and the pretense that standardized testing can provide meaningful data in assessment of school and educational quality. "...the learning process, that interaction between humans and between us and our environment, that complicated psychological and cultural practice, that dance of motivation and compulsion, is being handcuffed into narrow moments of transmission -- the downloading of facts. 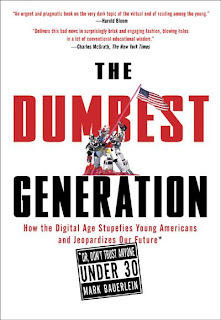 Students today are so deeply surveilled by security guards, teachers, administrators, and ubiquitous cameras; their acts in class are so patrolled in the search for errors, wrong answers, mistakes, missteps, and hesitations; their imaginations so hemmed in by the demands of the tests; and the brilliance, capacity, and literacy brought from home so discounted and attacked as simply a deficit; that the inspiration and curiosity for learning is being beat out of them. Those who excel, and some do, are a testament to the capacity of some children to endure boredom and persevere in doing what they are told. That is how the best of learning has become a crime. And it is time we called for a decriminalization campaign." Rick Ayers is adjunct professor in education at the University of San Francisco. My knife and whittling class went well at ESSA today. We carved our first spoons and shaped knife blanks for making spoon carving knives and sloyd knives. My student's hands are worn out from the work, but their strength will build. First time work is seldom your best work, but all students enjoyed the day and learned a great deal as you can see in the photos at left. Tomorrow, we will be joined by professional tool maker Larry Williams for his demonstration on how to heat treat high speed steel. He is an expert. On the subject of education, have you all heard of the "Rubber Rooms" in the New York City Public School System? I have an ESSA class staring on Friday and have been busy setting up and preparing materials. We are making crooked knives and sloyd knives and I'll teach beginning carving to 4 students. 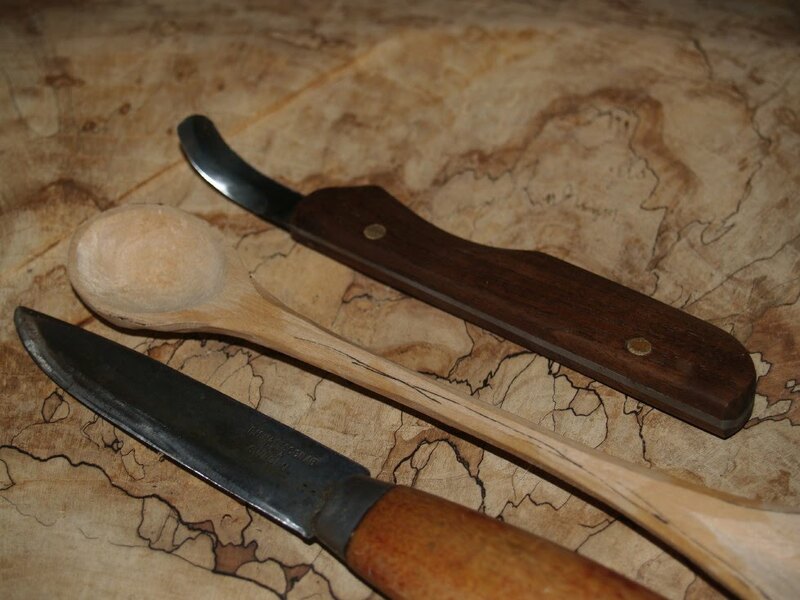 You can find a quick primer on making crooked knives in my Google Knol, How to Make a Spoon Carving Knife. This has been a beautiful day in Northwest Arkansas, made more so by a couple walks in the woods with my first, second and third grade woodworking classes from Clear Spring School. 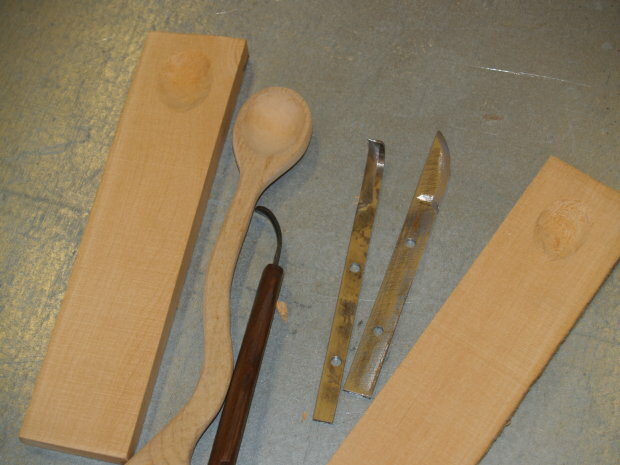 As suggested by Otto Salomon, woodworking projects, by being useful in the home, build a strong relationship of support between school and home. Anna's mother suggested that something useful that she would like us to make is a dryer for plastic bags so they can be washed, dried and safely reused rather than being just thrown away. Of course not all parents are so diligent in their efforts to recycle and reuse, so in order to justify making them in school, we needed to make them beautiful as well as useful, so they can serve as decoration, too. Then perhaps when they are tested and proved, more partents will begin reusing bags to save money and reduce the number of bags used. One count was that American throw away over a billion bags a year. Our walk in the woods was to find branches to use in making the bag dryers as shown in the photo above. 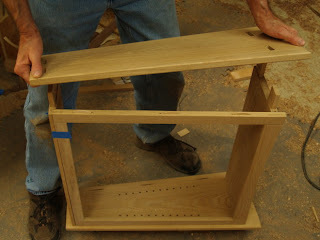 The only tools required are the brace and tenoner, and a 7/16" drill in the drill press. 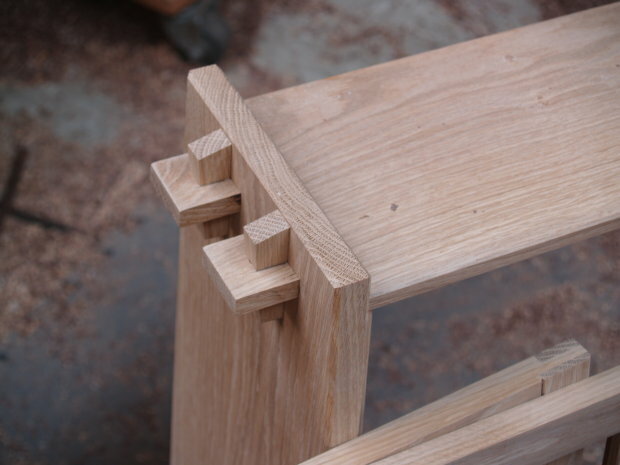 The kids loved operating the brace to form the tenons. We will finish this project next week. In the meantime, more and more unemployed or under employed Americans are turning to etsy.com to supplement their incomes by selling things they have made themselves, and as described here. You can find my own etsy store Here. an epidemic of technological nincompoopery? 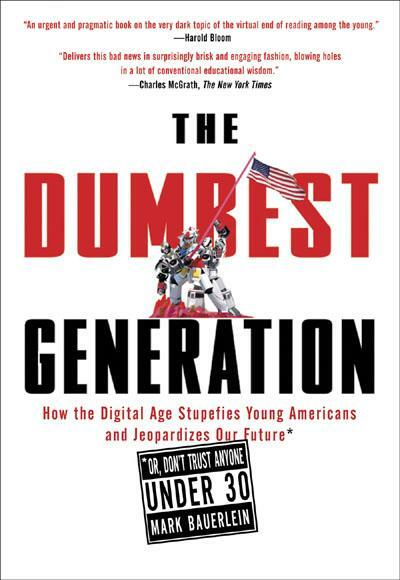 John Grossbohlin has been busy reading and sent these links: Some fear technology leaving kids in dark from Freemanonline and a new book The Dumbest Generation Finding published material relevant to the blog has been becoming easier as the stupidity engendered by technology has been becoming more and more obvious to many. 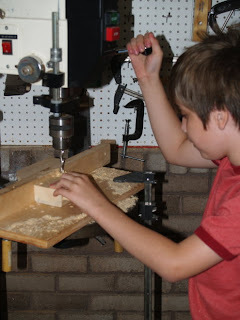 Can anyone see why kids might need to do some real stuff in school, like wood shop maybe? I have been on the subject of schools for some time, and I guess because I teach, and am the son of a kindergarten teacher, and am very concerned about where we are going with schools and schooling, that I become carried away. But it is most important to remember that the hands are not just for school. They are not just for learning, but for shaping our whole lives from the inside out. While in ages past, our survival was dependent on hand-skills, we seem to have engineered our lives so that is no longer so. But have we also engineered our psyches and souls to the same conclusions? I love that quote. It describes the development of both wisdom and humility. You can't spend much time in the woodshop as an egotist. You learn the necessity of plans b, c, d and f as you wrestle with mistakes of your own making and that you develop the strength of will and character to overcome. but to have this quote come back to me in this exact forms tells me that the blog is being read and that its ideas are being shared. I have found this quote from Rousseau's French text Emile usually translated as "workshop" (atelier) rather than "woodshop", except when translated from French to Swedish and then to English. And so I have made a point of using the French to Swedish to English translation. Also when translated direct from French to English, it is most often "scientist" rather than "philosopher." Which also makes an important point... that the hands-on explorations of physical reality are the absolute foundation of science. And so, if we become a nation of idiots we will have only the failure to recognize the cognitive qualities of our hands to blame. If you look at your own hands and your own experience you will see that the hands-on learning in schools can have serious implications long beyond the school years and far beyond its walls... even touching and giving meaningful shape to the whole of life. It's not just children who benefit. Adults studying new symbols, such as Chinese characters, might enhance recognition by writing the characters by hand, researchers say. Some physicians say handwriting could be a good cognitive exercise for baby boomers working to keep their minds sharp as they age. It is an extremely interesting article. Thanks, John. But does any of this have benefit in the day and age of standardized testing and push button text? It seems, yes, it does: Steve Graham, professor of education at Vanderbilt University sites several studies "indicating that good handwriting can take a generic classroom test score from the 50th percentile to the 84th percentile, while bad penmanship could tank it to the 16th." Better practice my cursive! One of the things any life-long learner will have noticed is that we learn so much more thoroughly when we have a direct use for what we learn. 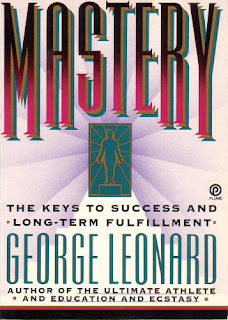 What we learn in response to a direct need for learning is learned faster and retained longer. One of the big mistakes we make in the education of teachers is to make the first years of learning theoretical, rather than practical. My proposal is this. Put more students in classrooms, not as practice teachers but as paid interns. Create a system of on-the-job training for teachers that leads to degrees and certification. This would be a way forward toward the Finnish model with one teacher and two learning specialists or aides in each classroom. Believe me, when teachers may have as many as 25-30 students to a class, they can use the help. Also, imagine an opportunity for students to explore their own lives as teachers before investing in a full 4-year degree. At the end of the day, it's the kids that matter. Every kid deserves a school where teachers, administrators, parents and community members look at them in the eye regardless of where they live or what they look like and say, "You are valuable. You are the future of America. We expect great things from you and we will make sure you get the education you need to succeed in life." We are responsible for our nation's students now and we know what needs to be done. I was hoping when I first saw this post that he would say more about the need for music in schools. We make a grave error in thinking that success has only to do with test scores and the amount of time spent in classrooms. But of course, it all has to start with the will to succeed. Also, John Grossbohlin sent this link to The Genius of the Tinkerer in the Wall Street Journal. I know that even for most of my readers, what I am about to present is going to be a stretch, but one that is worthy of thought. If you were very small and were placed in a setting in which the contributions and participation of some were exalted and while your own were marginalized, disparaged, ignored or belittled by large people in control of the classroom, it should be regarded as a subtle, but effective form of emotional abuse. I suggest a systemic and widely accepted form of bullying prevalent in American schools. It is what happens in schools in which multiple intelligences beyond verbal skills and math skills are ignored, and it is the reason that some kids learn to hate school, or express hatred for those who do well in it. You may have viewed the BBC video I posted earlier in the week, and would have seen where classroom team engagement in learning fosters an appreciation and understanding of diversity. The current competitive focus in schools does not. I can tell you of how classroom competition can lead to school yard bullying from my own experience. I happened to be a new, small, smart kid in 4th grade classroom in Mississippi in the 1950's. Everything was fine until recess when one boy held my arms behind my back while another pummeled me in the gut. I am reminded of this because we have incidences of bullying in schools, too often leading to physical violence among peers. And yet, intellectual bullying is approved in most schools. Being beat up on the playground is a more obvious expression of bullying, but can we not wonder about more subtle forms? Is there a relationship between intellectual bullying in schools as a model set for more physical and destructive forms on the playground, or on the internet? You may not buy what I'm saying. That's OK. Argue with me and help me to refine my thoughts. In the meantime, we are all smarter when our hands are engaged in making things, cooking, fixing, planting, making music and investing in the diversity of intellect available to us when we engage in the arts. And our children would healthier, happier, and more respectful of each other if our schools offered multidisciplinary, multiply-intelligent opportunities to engage in teamwork. Parents have an important role to play in stopping bullying in its tracks. You can find resources in this link: Is your child being bullied? In case you've wondered about the integration of arts, craftsmanship, science and technology, this is a nice view. As you can see in the photo, I am in the process of assembling the Stickley inspired white oak display cabinet. It has been widely reported that just 17% of charter schools perform better than public schools. If 17 % are better that means that 83% are no better and possibly worse. Those are disappointing statistics for those who put all their hopes in charter schools for a renewal of American education. But how is that 17% measured? Using the same old standardized tests? How else? It is time we learned to observe, measure, test and verify other important areas of learning and growth. Creativity, disciplined engagement, and teamwork. My sweet fair city of Eureka Springs came in number 10 this year in the top 25 small arts cities in America behind Asheville, NC, number one and Santa Fe, NM number 2. and only slightly behind number 9, Boulder, CO. We are about the smallest city in the competition. I'm not sure what others know about the arts, but it helps to be someplace where the arts are encouraged, and that here there is a culture of supports for the arts, for no island is an artist but to himself. 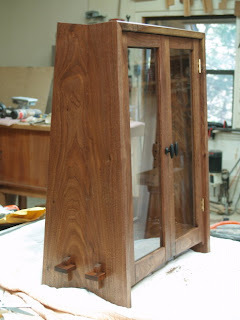 In the meantime, I have been closing in on the completion of some simple display cabinets. I've been doing the last bit of fitting of parts and beginning to sand. Photos will go off to the editors on Monday. As you will see in the photo, some sanding operations are best done by hand. It can take a few moments longer, but gets precise results when machine sanding would make a mess of things. If it takes 5 minutes and some elbow grease instead of a minute with a corded tool, who cares. The results good or bad can last beyond a hundred years. This is Corvette weekend in Eureka Springs, so there are literally hundreds of the high powered behemoths rumbling around town. And even more motor cycles are here for the weekend, as spillover from a major motorcycle gathering in Fayetteville, AR. I guess one good thing about it all is that you can't come to Eureka Springs without getting just a little bit exposed to the arts. And I would tell Tom, that without the arts, there would be no science, technology, engineering or math. There is a complete misunderstanding of the arts in relation to science, engineering and math. Without the exploration of materials through the arts, these other subsets of the arts would never have developed in the first place, and without children being involved in making things, there would be no further engagement in scientific exploration. The idea that the arts and sciences are different things is asinine. Make, fix, create, plant, fix dinner. That comes next. A friend and founder of the New England Association of Woodworking Teachers sent me a link to another program offering hands on learning. The Academy of Arts, Careers and Technology. Principal Janis McCreary says, "It used to be schools like this were considered vocational education, training kids to go right into the workforce. The difference is we are a career-tech school, so our focus is to prepare the kids for not only the work place right away--if that's what they want to do but for a higher education." "After high school we feel we're preparing them more here because they're getting the hands on experience."